This summer a survey was circulated through the Southwest Minneapolis community asking about the qualities and places that defined each of the nine neighborhoods included in the study. Over four-hundred residents participated, including sixteen members of the Armatage community, who I would like to take this opportunity to thank for donating their time to my study. The results of the survey will be used in my thesis, on the role of community involvement in the field of heritage preservation, as well as shared with the neighborhood associations. Of the sixteen Armatage participants, fourteen percent were racial or ethnic minorities. The residents ranged in age from twenty-nine to esixty-three and on average had lived in the neighborhood for fifteen years. 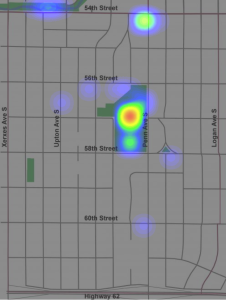 The general consensus was that the way the neighborhood feels is more important than the way it looks, which was a viewpoint shared by residents throughout Southwest Minneapolis. Additionally, participants indicated that people, parks, homes, and restaurants are the most important elements in the creation of neighborhood character. Residents were asked to describe the character of Armatage neighborhood in three words, leading to a list of thirty-one different words (shown in the word cloud graphic) with the four most frequently utilized words being friendly, active, quiet, and family. When asked what they would change about Armatage neighborhood if they could change one thing, respondents came up with a list of ten different changes they would make. The most frequent answers were restricting residential new development to better maintain the historic appearance of the neighborhood (19%) and decreasing the amount of airplane noise (19%). Participants were given the opportunity to choose three places in the neighborhood that they would preserve for future generations of Armatage residents, which led to the identification of fifteen places important to maintaining the character of the neighborhood (shown in the map graphic). Fifty-one percent of the places people felt were important to the neighborhood were built structures. Armatage Park was mentioned by fifty percent of participants making it the most frequently discussed location, Armatage school was listed by thirty-eight percent, and Minnehaha Creek by twenty-five percent. Twenty-five percent of participants indicated that small commercial hubs were important architectural sites within the neighborhood, specifically nodes along Penn and Xerxes Avenues. Twenty-five words were used by Armatage residents to describe the term heritage, with the most common being history, culture, and tradition. Thank you again to everyone who took the time to participate. If you have any questions about the study please contact me at sundb173@umn.edu. This entry was posted in History, Neighborhood Survey on November 13, 2015 by anacoordinator.